Naturopathic and integrative treatment focused on immune system health as a potential primary, secondary, or tertiary cause underlying Allergies, Asthma, Arthritis, Auto-immunity, Candida, Celiac disease, Chronic fatigue, Cold & flu, Skin conditions (Eczema, Dermatitis, Psoriasis, Viral & Bacterial skin issues), Fatigue, Food Sensitivities, Infection, Toxin accumulation, and Cancer. The focus of the Immune System is to provide constant surveillance throughout the body in order to ensure overall ongoing health of an individual. If the immune system is working properly, a person will have a reduced, or fully eliminated existence of colds, flu’s or other types of infections. With fully functioning immunity, any infection, bacteria or virus that does enter the body, will not ultimately be noticed, as its the immune system that will rein in, control, and kill the pathogen, which ultimately results in an avoidance of harm or detriment to an individuals health. The immune system works 24 hours per day, whether a person is awake or asleep, and is the bodies ultimate line of defence to any outside threat to ones health. So as long as the immune system is functioning healthfully, a person can feel well, live well, and feel confident that the body is doing what it is designed to do. Problems arise when the immune system does not function correctly in order to protect a person from infections or other health threatening concerns. It is when the immune system under functions that a person becomes more susceptible to external colds, viruses and the like. Normally the immune system can handle these viral/infectious threats, however when the immune system is running in a deficient state, it becomes overwhelmed, and is no longer able to control and eliminate these outside infectious risks. What results is a further under functioning immune system, greater sensitivity to being sick, and a reduced ability to overcome infections and illness. The short term impact of this is not only feeling unwell, but greatly increased chances of constant recurring illness and lack of health. Fatigue, nausea, fever, direct infections will result, and further complications may impend. The long term impacts of an under functioning immune system is that a person not only has to deal with ongoing, chronic, repeated bouts of infectious illnesses, but a much larger propensity to chronic disease such as auto immunity, cancer, sleep issues, reduced quality of life, complications leading to heart disease, diabetes, digestive illness, allergies, chronic fatigue, skin diseases, and ultimately any chronic lifelong illness that can ultimately reduce a healthful lifespan. Without a proper functioning immune system, any proposed aspect of one’s health can and will ultimately suffer in the short and long run. 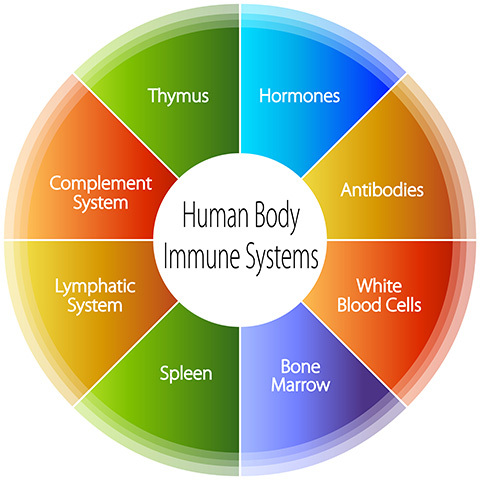 The immune system is made up of a vast array of different immune cells. 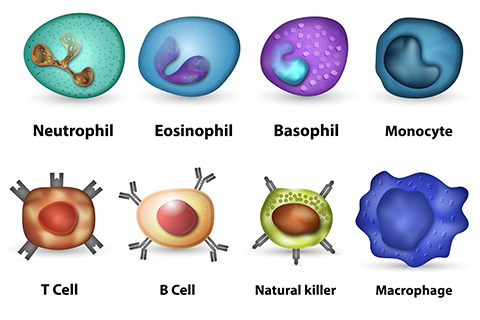 Some of these cells are activated immediately upon contact with a virus or infection, while others are reserved for more latent and long term activation and infection control. White blood cells (wbc’s) make up the crux of one’s immune system; including neutrophils, lymphcytes B and T cells), basophils, and monocytes. The vastness of the immune system is accurately spread throughout the body, in order to be prepared for any host defence threats. Immune cells line the digestive tract, mucous membranes of the mouth and nose, as well as all other areas where the internal body comes in contact with the external environment, but also thrives within a person’s lymphatic system (a highway like circulatory system spread throughout the entire body). Each immune cell which makes up the immune system has a particular focus and protective job. Immune cells such as Natural Killer Cells, for example, don’t target invading microbes entering the body (ie infections, viruses etc), but rather target and destroy compromised host cells, such as tumour cells and virus infected cells. It is critical that each immune cell functions well and ultimately knows what to do and how to respond. Mistletoe therapy has been used for centuries with a primary focus on a better functioning immune system. Sometimes indicated for chronic immune system diseases, or acute instances as well, mistletoe therapy can effectively promote an enhanced immune system functioning, and ultimately help a person overcome current disease or health issues. Much research and positive clinic outcome has been derived from Intravenous (non cancer) therapy. Intravenous (IV) therapy involves delivering high doses of vitamins, minerals, and/or other medicines directly into the bloodstream to provide rapid, effective therapeutic benefit and relief of symptoms.